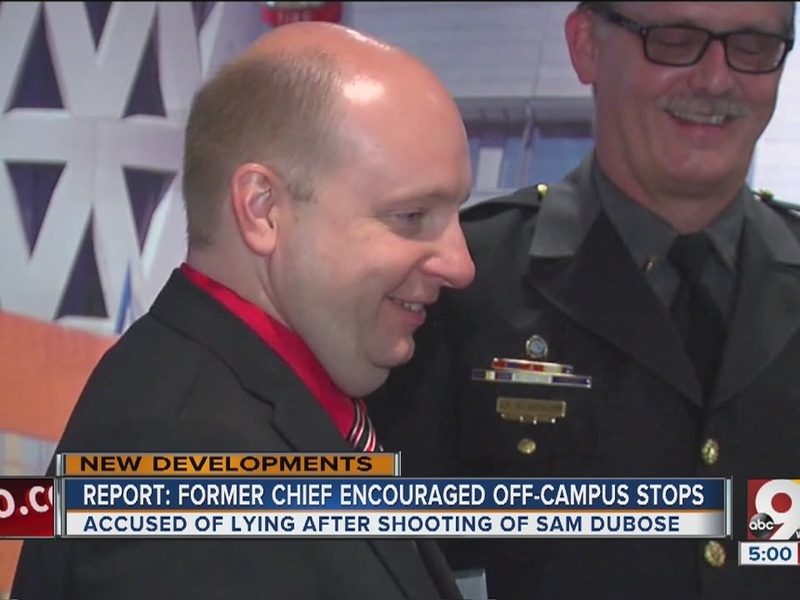 CINCINNATI – Former University of Cincinnati Police Chief Jason Goodrich was behind the push in off-campus traffic stops like the one that resulted in the fatal shooting of Sam DuBose last summer, but failed to take ownership of the strategy after that shooting, according to a new report. The report, prepared by independent firm Exiger on behalf of the university as the first part of a top-to-bottom department review, found that Goodrich and former Maj. Tim Thornton championed the push for off-campus traffic stops as part of a proactive strategy to address crime in the neighborhoods surrounding UC. 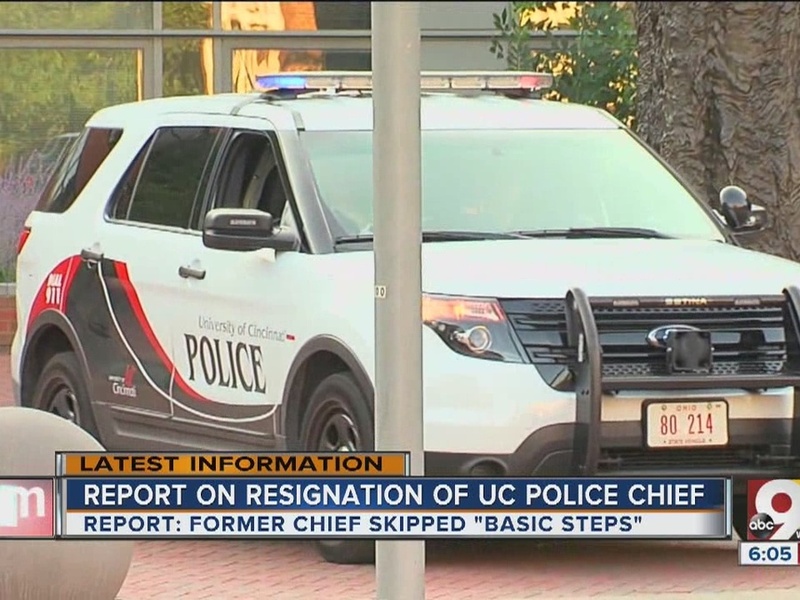 However, Goodrich failed to take “basic steps to gather available data and formulate management information by which UCPD could have assessed risk and better understood the conduct of its officers in the field, both individually and collectively,” the report concluded. Those missing "fundamental steps" called into question Goodrich's ability to carry out his duties, the investigators wrote. Goodrich "misrepresented his knowledge" about the stops to both UC administrators and Exiger's investigators, according to the report. Thornton also “was less than truthful” with Exiger’s investigators and concealed his knowledge of the off-campus traffic stops. “There were certainly inconsistencies, and that was revealed in this report,” UC Vice President for Safety and Reform Robin Engel said. Additionally, Goodrich’s failure to take ownership of the traffic stops strategy the DuBose shooting “eroded the trust and confidence of, at least many, UCPD officers in Goodrich,” the report found. “We needed more oversight and more levels of supervision,” Engel said. Before Goodrich's arrival, UCPD was averaging 86.5 stops per month. After he became chief, that more-than-tripled to an average of 271.5 per month, Exiger's investigators found. Also, the average number of citations given by UCPD nearly quadrupled from an average of 64.5 per month before Goodrich to an average of 256. In the two months prior to the shooting, stops and citations had hit an all-time high, averaging 412 stops and 392.5 citations, according to the report. Avondale Pastor KZ Smith, a member of the UC Safety and Reform Community Advisory Council, said it the report wasn't a surprise to local members of the black community, who always thought there was a problem. “It looks bad, but I think that, because UC is doing what they’re supposed to do, it will end up being something good,” Smith said. Goodrich could easily have compiled the data on the off-campus stops, as UC administration officials did within weeks following DuBose’s death, according to the report. Goodrich and Thornton resigned from UCPD in February. Exiger’s 12-member team met with students, faculty, staff, administrators, UCPD officers, Cincinnati police officers and residents, officials previously said. UC has taken other action since DuBose’s death. The university reorganized its public safety operation. They hired Cincinnati Police Department James Whalen as director of public safety – he has also served as interim chief since Goodrich resigned. They also hired Gregory Baker, the former head of the Cincinnati Initiative to Reduce Violence, as the director of Police Community Relations and appointed Engel as vice president for Safety and Reform.